17a. [*English rock group? ], STONEHENGE. Cute clue. 24a. [*Many party games], ICEBREAKERS. 37a. [*Railroad engine, in old lingo], IRON HORSE. 52a. [*Seattle tourist attraction], SPACE NEEDLE. 62a. [*Medal for bravery, maybe], BRONZE STAR. 69a. [A very long time … or a hint to the starts of the answers to the five starred clues], AGES. It’s a good theme, but I wish it had been downsized a bit so as to give the rest of the fill some more breathing room. The corner stacks with 7-letter answers plus six thematic entries made everything else squeeze around those parts—and the result is Crosswordese on Parade. The words I consider crosswordese (and otherwise subpar) are particularly sore-thumb-like in Monday and Tuesday puzzles, when they are more likely to be foisted on newer solvers who haven’t yet been forced to learn them. To wit: ANON, ARNO, HIRER, ESPO, ITO, OSS, ONE-A, EPI-, STEN, -ENNE, SOO, EPODE, and NENE.—I think a lot of bright, college-educated people who haven’t been tackling crosswords would look askance at these. Plus foreign words: MES, TRES, NUEVO, CHERE. Oof! 2d. 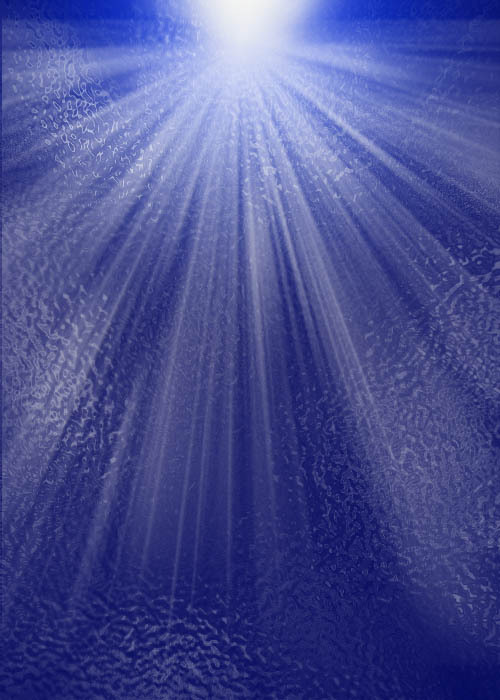 [Dub], ENTITLE. Given that ENTITLE is much more often used to refer to people being entitled to certain things, and not “bestowing a title upon,” this is a weird choice for a clue. 3d. [“Let’s Make a Deal” choice], DOOR ONE. This is either a fun entry or a terrible one. 40d/61d. Both AMS and PMS? Duplicative. 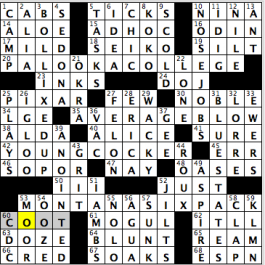 It wouldn’t be if the newspaper crosswords weren’t all terrified of referring to premenstrual syndrome. Would have been open to the plural abbreviation for “prime minister” to avoid the repetition. 48a. [Minnesota range known for its mining of metal], MESABI. I spent four years in Minnesota so I know of “de Range,” where iron is mined (and iron is omitted from the clue because of the central themer). A friend’s husband is a train engineer whose trains cart massive amounts of Mesabi iron ore to ships in Lake Superior. That doesn’t make this a familiar, Tuesday-friendly word for most solvers, though. 45d. [Written introduction? ], NAMETAG. Cute clue. Only three theme answers, you’re thinking? I’m thinking he did a great job coming up with these three good puns! Can anyone think of any more possible entries that could have been used, let alone more symmetrically friendly ones? I’m sleepy now, so I got nothing! Fill as usual is impeccable. A sample! 14A [“___ oughta…] WHY I – Matt seems to be a master at natural partial phrases! 56A [“What can Brown do for you?” sloganeer] UPS – You knew I was mentioning this! If I had a dime for every time I heard this phrase…. 6D [Murray’s “Ghostbusters” costar] AYKROYD – His last name has a funky spelling. Learn it. He’s in puzzles fairly often! 9D [“The Subject Was Roses” director Grosbard] ULU – New one on me. Crosses made it gettable. He does exist! 26D [Subject of a Magritte painting (or is it?)] PIPE – I had to look this up, but as soon as I saw it, I remember this painting. 36D [Does some face recognition?] TELLS TIME – Best clue of the puzzle! 45D [1978 Cronyn/Tandy play, with “The”] GIN GAME – Another new one on me. I did know these two were married, though. This puzzle was fun. 3.9 stars. It is Monday night as I pen this, and now I am going to sleep! Nice puzzle today by Mark Bickham. The theme surprised me! 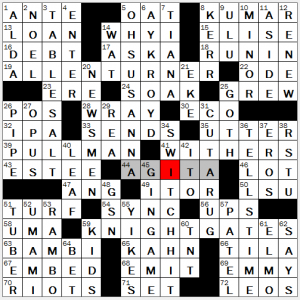 I thought it was just a bunch of “this AND that” answers, until I got to the payoff at 71-Across! Nicely done! All of the theme answers follow the format S??? AND S?? ?, which is nicely clued by some cryptic wordplay of the word SANDS. Pleasant little surprise, at least to me, at the end of the puzzle. 5D [Until now] HITHERTO – Here’s a word you don’t see or use that often … unless maybe you write legal briefs! 29D [“Still wrong, take another stab”] GUESS AGAIN – These two long answers that each cross three theme answers are very smooth. Very enjoyable! 4 stars for the suprise payoff at the end! Or make that “BO-CA Bash,” because each of today’s five peppy themers are two-word phrases in which the first word begins with “BO-” and the second with “CA-.” So no homage to partying in southern Florida; and no mere ONE B.C. here either (so to speak…), but five “BO-/CA-“s. Sweet! 17A. BODY CAMERA [These days, an arresting officer might wear one]. As part of an overall overhaul of public policy and the criminal justice system, Secretary Clinton has been advocating for this for some time now. 40A. BOLIVIAN CAPITAL [Sucre]. BOLIVIAN constitutional CAPITAL. As opposed to La Paz, which is the seat of the country’s government (and more like its administrative CAPITAL). Also: a grid-spanner. 53A. BOXED CANDIES [Theater munchies, such as Milk Duds or Sno-Caps]. Make mine Whoppers or Dots, please. 65A. BOOTY CALLS [They’re made to friends with benefits]. Pitch-perfect clue and laugh-inducing fill. Terrific. Terrific, too, are the two vertical nines: MISS EGYPT and JUMPS SHIP. As for the former, realized (yet again…) how provincial my world-view is at times. But I’m gonna hazard a guess that entrants in this [Cairo-based beauty contest] are not of the Muslim faith. Re: the latter—I love how this one, with its literal, non-emotionally-based clue [Goes overboard?] runs through watery fill. And not just once, but twice, with the RHINE [Düsseldorf’s river] and the somewhat more dramatically clued SEAS [Choppy expanses]. Finally, there’s some (more) fine wordplay to be found in the cluing, starting with [Some choice words] for AND/OR, the literal response in which “choice” is understood as a noun. But let’s not forget that “choice” is also used as an adjective. Only not today… [Moon shiner?] for BEAM made me BEAM, and in light of the recent visits by Pope Francis to DC, NYC and Philly, the punny [It’s worn for the masses?] ALB combo was especially timely. (And when in Philly, did he receive [Greetings from Rocky] “YO!”S?…) Oh–then something I’d really not given thought to previously, but which is (d’oh!) so obvious: didja ever notice how ALL is right there in [Totally]? Totally! Salutations, Word Crossers! My name is Jim and I’m making my Fiend debut, so … please be gentle with me. 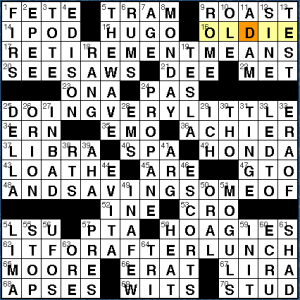 Today’s offering comes from the venerable Mel Rosen who has been making crossword puzzles for more than 40 years. So, is this puzzle Mel’s RETIREMENT notice? The theme is a quip broken into four grid­-spanning entries. RETIREMENT MEANS / DOING VERY LITTLE / AND SAVING SOME OF / IT FOR AFTER LUNCH. Not much wordplay going on here, but the quip is broken up nicely and is good for a chuckle. We also get AGE, OLDIE, and ACHIER. A subtle hint, or just coincidence? Beyond that, there’s not much to say, theme­wise. Four grid-­spanners means a high amount of constraint on the verticals. Mel limits this by means of some rather long fingers of blocks coming in from the sides. The upshot is that there aren’t many long Downs. The longest are the 7-­letter trio of THE WAVE, PROPANE, and ESCORTS, all very nice (especially THE WAVE), but nothing very sparkly. This segmentation means we’re not subjected to too much cruddy fill. However, we do have 23 3-­letters to contend with, some of which are tortured (RTS, ERN, INE, ONA, EMS). But overall, it’s not too distracting. The straight­forward cluing meant the solve was quick if not exactly memorable. SEE­SAWS paired with HOAGIES. Sounds like a winning combo to me. EDISON v. TESLA. Here’s what TESLA had to say about EDISON after the latter’s death: “If he had a needle to find in a haystack he would not stop to reason where it was most likely to be, but would proceed at once, with the feverish diligence of a bee, to examine straw after straw until he found the object of his search. … I was almost a sorry witness of such doings, knowing that a little theory and calculation would have saved him ninety per cent of his labor.” I guess they weren’t such good buddies. Never heard the phrase “IN BAD“. Is this a new thing? Or an old thing? Or a regional thing? Something tells me Mel will have plenty of crosswords to keep him busy if he decides to stop making grids. 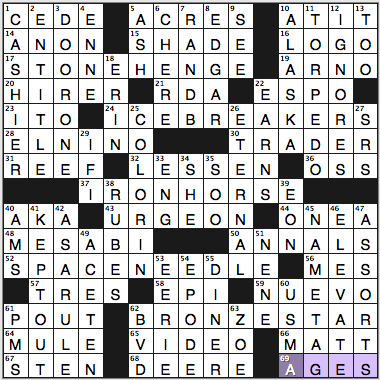 But Bernice Gordon proved that you never need to retire from crossword construction! With that, I close my first ever blog post. I leave you with Bill O’Reilly and Donald T. Rump doing THE WAVE. Excelsior! Hello everyone! 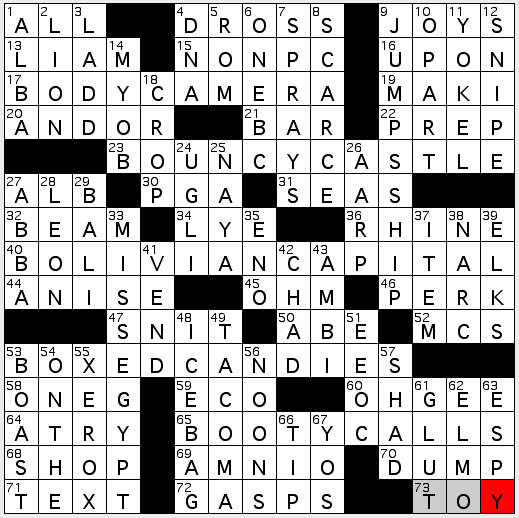 Today’s crossword puzzle, brought to us by Mr. Tony Orbach, is all about giving guys names Joe, real and fictional, some love. 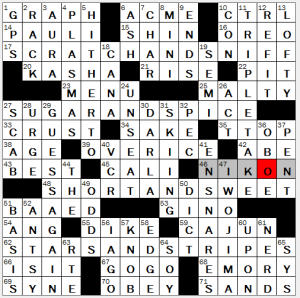 Each of the two-word theme answers are puns, and both words in each theme answer could come before or after the word “Joe.” If there ever was a good time to be a Schmo doing a crossword puzzle, this would be it, because you could have gotten some love in this grid. PALOOKA COLLEGE (20A: [School for middling boxers?]) – Joe Palooka (comic strip), Joe College. AVERAGE BLOW (35A: [Gale that’s about par for the course?]) – Average Joe, Joe Blow. YOUNG COCKER (42A: [Spaniel puppy?]) – Joe Young, Joe Cocker. MONTANA SIX-PACK (53A: [Physical attribute of a toned Miley Cyrus character?]) – Joe Montana, Joe Six-Pack. I couldn’t come across ROUX without thinking about the foreign lessons I’m currently taking and trying to nail the “H”-like sound at the beginning of the word when trying to say the word for “red” in French (44D: [Gravy thickener made of flour and fat]). Loved the fill of BOLLIXED UP, and I need to incorporate that more in my vocabulary (3D: [Bungled]). There was huge hype for the summer movie involving the man in a suit who can decrease himself to the size of an ANT, but, as always, I didn’t make it out to the movie theaters to see if it was worth it (13D: [“___-Man” (2015 movie starring Paul Rudd)]). Also in that area of the grid is the awesome fill of NOSE JOBS (10D: [Rhinoplasties, familiarly]). Some might not like the fill of KLMN, but all I thought of after putting that it was that the Dutch airline just wanted an extra letter in its company name to get more attention (59D: [J followers]). “Sports will make you smarter” moment of the day: REAM (65A: [500 sheets of paper]) – Professional soccer player Tim REAM is an American central defender for the British SkyBet Championship team Fulham FC. Ream has also made 17 appearances for the United State Men’s National Soccer Team, and was a part of the squad as recently as this year’s Gold Cup tournament, the bi-annual competition determining the best soccer-playing country in North and Central America. See you on Wednesday, and thank you so much for your time! This entry was posted in Daily Puzzles and tagged Elizabeth C. Gorski, Kurt Krauss, Mark Bickham, Matt Jones, Mel Rosen, Tony Orbach. Bookmark the permalink. welcome and great job, jim! Thanks, but it looks like I scared away all the other commenters!